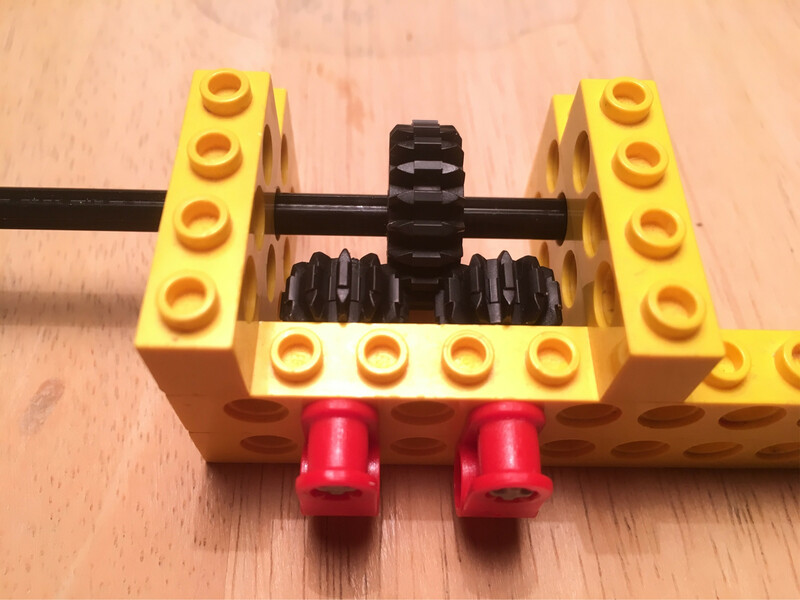 How can I assemble 2 opposing gears so that the axle rotations are perfectly parallel? 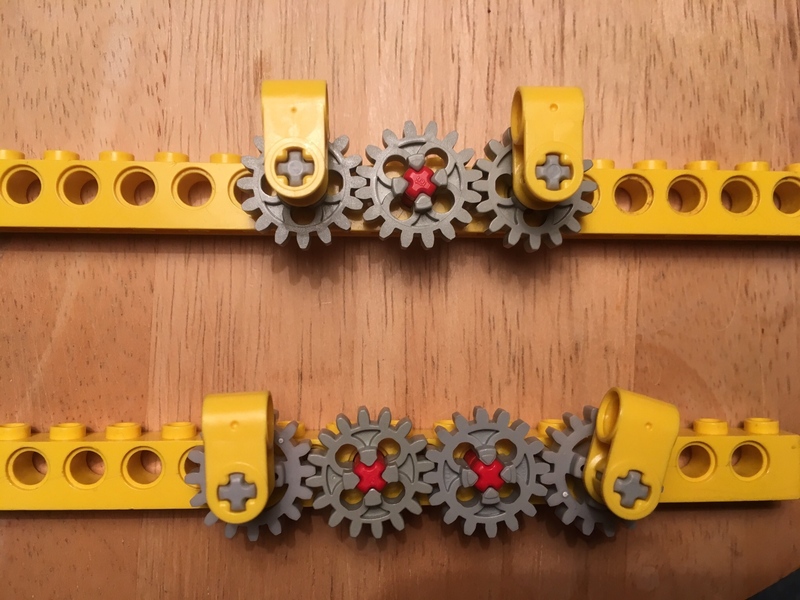 Due to the way all the modern LEGO gears are perfectly quarter-turn symmetrical, there doesn't appear to be any way to assembly 2 opposing gears such that I get a 2 perfectly parallel axles. When one gear it perfectly centered, the other gear is rotated half a tooth. How can I get 2 opposing gear's axles to be perfectly parallel? Are there any older or special gears that are useful here? Otherwise, are there any good workarounds? 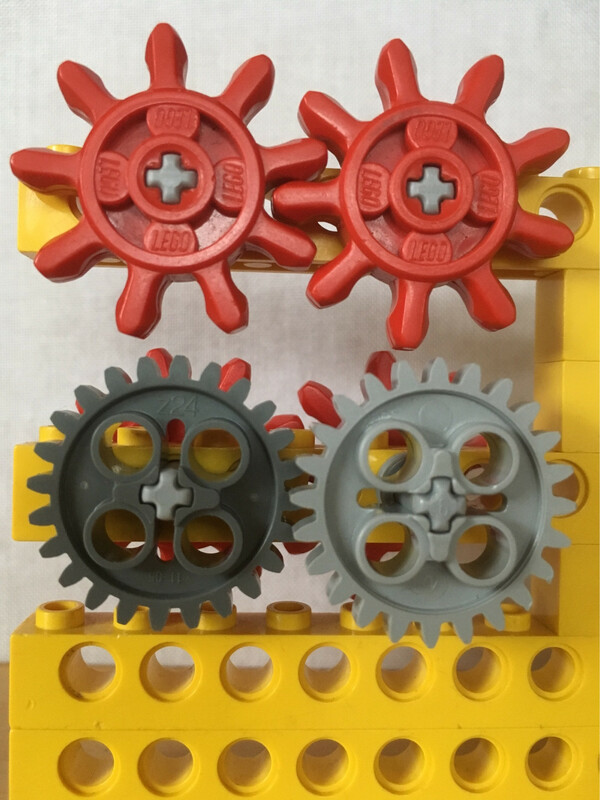 If you use a crown gear or bevel gear to connect your gears twice perpendicularly, they are exactly opposing each other, turn in opposite directions, and are parallel (if the respective axle is aligned to the coordinate system of the construction). Like with all gear-to-gear connections, you have a little wiggle room that may exceed half a tooth. 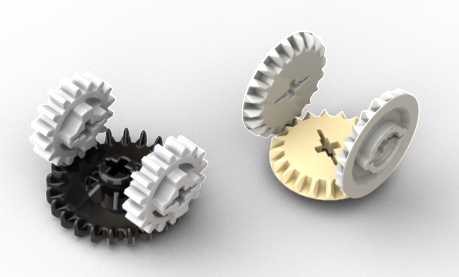 If you want the opposing gears next to each other, you can use further gears attached to these (coming with yet more wiggle room). 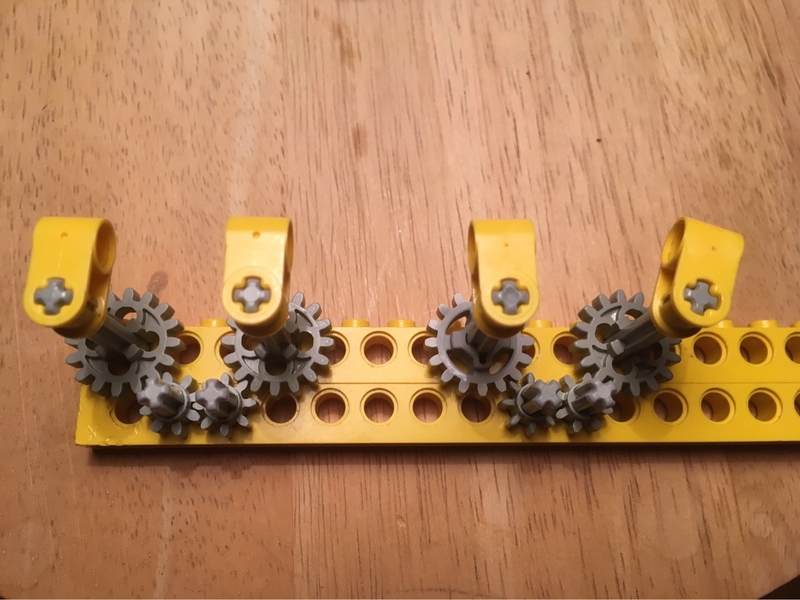 How can I get 2 opposing gear's axles to be perfectly parallel? Are there any good workarounds? You could use an idler gear. It will even out the offset. Yet, at the same time, it (or any odd number of idler gears) will cause both axles to spin in one direction. On the other hand, two (or any even number of) idler gears will not affect the asynchrony of the axles, but will bring back the offset. Then again, placing a single idler gear crosswise will compensate the offset without changing the desired clockwise/ counterclockwise movement. Besides, here's two 8 tooth idler gears in line. Both axles seem to be perfectly in parallel to each other. Unfortunately, that's actually because of the large amount of play involved. So this solution just benefits from the wiggle and does not run too reliably. Are there any older or special gears that are useful here? Having an uneven number of teeth, these nowadays obsolete gears from the early 70s would work as well. As you can tell from the overlapping grey gears, the axles are quite parallel (minus some backlash). You could use a belt system to get a perfect, parallel rotation. 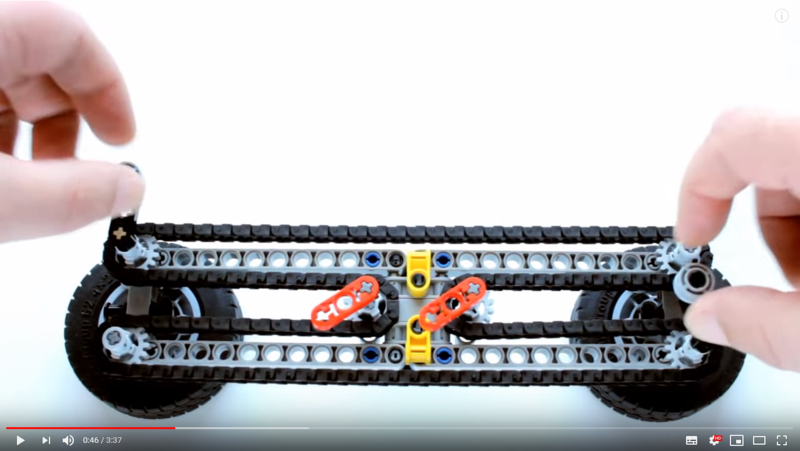 The chain links used in this video are #3711 and the gears appear to be the same as the ones shown in your example. There doesn't seem to be an easy way to get the gears to turn in opposite directions without the use of gears (without that half tooth lag). Two high friction, Technic rubber wheels, placed directly against each other will rotate almost perfectly. Although they might de-synchronise after many revolutions. What about a clutch gear ? It can help with its center axis that can slip. Not the answer you're looking for? Browse other questions tagged technic building gears or ask your own question.